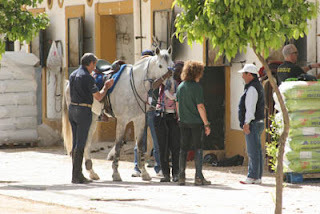 I took an overnight train from Catalonia to Jerez de la Frontera - the starting point of this year's Al-Andalus, making my way eventually to the Centro Militar de Cria Caballar where the horses were stabled for Al Andalus and where the vetting in would be. Immediately I saw some of the staff from last year's Al-Andalus Raid who gave me a warm welcome, including at the inscription - sign in - where Gabriel, Ines, and Rosa were busy registering riders and handing out 'welcome' bags with goodies from sponsors - Tshirts from Kaliber and Andalucia tourism, small bottles of Extra Virgen Aceite de Oliva (exquisite olive oil), among other things. I wandered around, peering in stalls and greeting old friends, and immediately making some new ones as it's so easy to do at this ride. I'd been studying Spanish diligently - well, for at LEAST a month before I came to Spain - so it was a wee bit better than last year. I attempted to use it a bit, which is fun, because the Spanish get a kick out of it, (unlike some other countries and languages who don't have quite the same humor), and they always tried to help me, or at least guess at what I was trying to say. If I couldn't find the Spanish word I needed and sign language didn't work, we just laughed. With my Spanish, or Spanglish, as I came to call it (mangled Spanish), I probably didn't get all my stories straight, but... that's how the story goes, right? 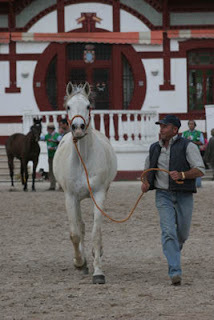 The stables were full of gorgeous Andalusions, a good percentage of which I estimated to be stallions, judging by the bellowing welcomes that the arriving Al-Andalus horses were getting. A few of the stalls had signs posted by their doors: "Peligro! Pastor encendido" which, if you choose to go by one particular online translation, means "Danger! Ignited shepherd." Siesta time in Spain is not just for humans, it is for horses as well. 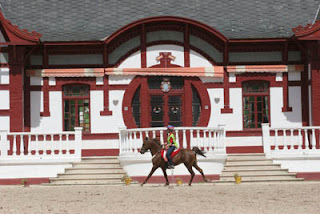 All was quiet around the stables (except for one trumpeting stallion) in the middle of the afternoon. People had disappeared, and horses were resting back in their stalls, not even sticking their heads out in the sun. Vetting in went on throughout the day (except for the big block of siesta time). 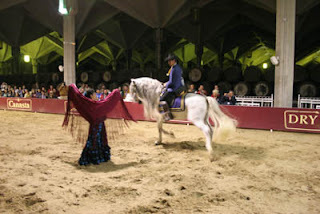 There were all sizes and shapes of horses for Al-Andalus - mostly Arabians and Anglo-Arabians; I saw at least 2 gorgeous little Arabian stallions, one of which would be ridden by a very tall boy. Considering the fact that most of Europe had a hard cold winter and it was difficult to train, most of the horses I saw looked well enough, except for 2 exceptionally skinny horses, 1 with no muscle tone and very hairy. You can see far too skinny horses anywhere - the US, the UAE, Europe - and it makes me wonder if there shouldn't be some sort of standard body fat qualifying criteria for horses in endurance rides. It can't be good for the horse to be so under-nutritioned for an athletic event, can it? I was told there was a "ride meeting for officials at 4 or 5." However, I've been to Andalucia before, and I had already set my watch to Andalucian time when I arrived. I went out and found a cappuchino in a cafe and came back to the stables, strolled around and visited and took pictures as 4:00 then 5:00 passed. The riders and crews were saddle fitting, walking horses, riding, lunging horses, attaching easy boots to saddles, adjusting bridles, sorting leg boots, re-packing trailers and assistance cars, filling water jugs, making last minute adjustments to gear before tomorrow's start - you don't want to begin an 8-day ride with ill-fitting tack. I spotted my Belgian friends Leonard Liesens and Caroll Gatelier - Leo would be riding a horse of Joelle Sauvage, and Caroll crewing. 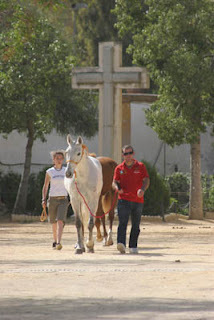 Joelle and her husband Bernard and daughter Melanie - Belgians now living in Alicante, Spain - brought 3 horses to Al-Andalus, for her, for Leo, and for Leo's friend from Argentina, Miguel Pavlovsky. For some people, to loan a horse out to a stranger is nothing; to other people, it's like loaning out your child. For Joelle, her horses are her babies. Miguel and Leo have known each other and ridden together for years, but Joelle didn't know either of them, had only met Leo through email when he contacted her. But she graciously offered her horses to the foreigners. They were all pure Arabians from France and Spain, 6, 7, and 9 years old. I'd been wondering what it is that brings people here to Al Andalus. 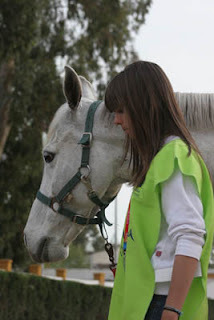 On the surface, it sounds fun and romantic - riding on horses for 8 days across a section of Spain, and heck, 60 kilometers (37 miles) is not THAT far, and there are many who argue that anything less than 80 km (50 miles) is not "endurance." But anybody who can imagine riding 60 kilometers for 8 days, and moving each time in between would have some idea that there's much more involved. Not to mention the expense, and the time taken off from work, for you and your crew - because you cannot do this ride without a crew of at least one person, especially if you are entered with two horses. Joelle simply said what was a common theme among many people: "Al-Andalus is my dream. I've seen some of Andalucia, but I want to see more by horseback. I want to finish, and enjoy." "To finish": last year only one Binomios rider finished all 8 days. It is a challenge to nurse a horse through 8 days of riding, and even, for the Equipos entries, getting a horse through every other day of the endurance ride. Spirits were naturally light and high at the start of such a challenge, and that carried over to the rider meeting that started after the official's meeting that began, well... well after 5 PM. The rider meeting pretty much started with mayhem and ended in mayhem, and that was pretty much the pattern for the whole ride. But that's part of Al Andalus - 40-some riders, 80-some crews and friends and families, a dozen officials, people who speak not one specific common language but Spanish, French, English, Flemish, German, Italian, and Portuguese, all needing some interpretation, gathered together in one room with bad acoustics (and no microphone for the officials), trying to sort out details for tomorrow's start of a big exploit. And, try keeping so many people quiet so everybody can hear! One thing repeated in several languages came from Jose Manuel Soto: "Enjoy the ride! Go slowly! The last two days are very hard, and it is very difficult to win this ride. Conserve your horses so that you will ride every day!" 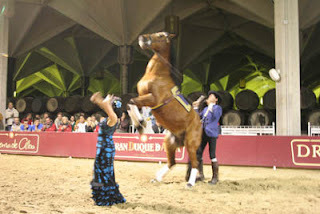 Afterwards everybody adjourned across Jerez to the Bodegas Williams & Humbert, where we first watched a mini-show of beautiful dancing Andalusians and a woman; then, after speeches by some of the sponsors from the winery, we were plied with beer and wine and tapas. Tomorrow's start was at 9 AM, but I didn't dare look at my watch when I hitched a ride in the crowded Belgian car to my hotel for a short night of rest.